Helen Louise (Morris) Oberkonz, age 94, of Imperial, PA, passed away Tuesday, January 22, 2019 at Victoria Manor, Oakdale, PA.
Born December 9, 1924 in Holbrook, PA, she is the daughter of the late Cleveland and Goldie (Geho) Morris. Helen was employed as a welder for American Bridge, Ambridge, PA, during World War II. She worked for Superior Meats, Aliquippa, PA, as a packer in their meat department. 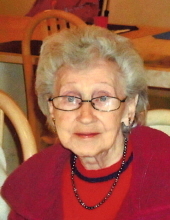 Helen was a member of the Ladies Auxiliary in Hopewell Twp. She enjoyed crocheting, puzzle books and word searches. Helen is survived by three grandchildren, Deborah (Bradley) Lewis, of Ambridge, PA, Lesa (Mike) Workmister, of Oakdale, PA, and Tracey Lewis; several great-grandchildren; several nieces and nephews. In addition to her parents, she was preceded in death by her husband, Edward Oberkonz, who passed away in 2008; two sons, William and Robert Lewis, who both passed in 2009. Friends will be received on Monday, January 28, 2019 from 4-8 p.m. at Kesterson-Rush Funeral Home, LLC. 3275 W. Roy Furman Hwy. Rogersville, PA 15359. Telephone: 724-499-5181. A funeral service will be held Tuesday, January 29, 2019 at 11:00 a.m. at the funeral home with Dr. Ed Woods, officiating. Burial will follow at Rosemont Cemetery, Center Twp., PA. Please view and sign the online tribute wall at www.kestersonfh.com. To send flowers or a remembrance gift to the family of Helen Louise (Morris) Oberkonz, please visit our Tribute Store. 3275 W. Roy Furman Hwy. "Email Address" would like to share the life celebration of Helen Louise (Morris) Oberkonz. Click on the "link" to go to share a favorite memory or leave a condolence message for the family.